After “Woman In Black,” we have confirmation of something that has been increasingly obvious all season: Grimm cannot handle a bunch of spinning plates at once. When the finale cuts to black, there is no sense of finality, no feeling that a chapter has closed, with another adventure is around the corner. There is only the sense of incompletion, in limbo, with every plot left on a cliffhanger. Hank hunkers down in his house like a paranoid Yosemite Sam, toting a shotgun and a pistol. Monroe and Rosalee contend with Adalind’s witch cat that scratched and infected Juliette, whose condition in a hospital starts to spike as she awakens with black eyes. Adalind is gone, seemingly acting without Renard’s control anymore. And in a twist telegraphed from the moment the titular Woman In Black shows up, and Nick loses the last remaining evidence linked to his parents’ murder, only to discover that his mother is actually alive. Of all the serialized elements introduced this season, from the Reapers of the Grimm attacking Monroe outside a random house, hunting Nick down, of Wesen communities hidden within Portland, or an international war between royal families and an underground resistance, or Renard’s mysterious and as yet unclear place in the Wesen world, the finale foolishly reintroduces the most ludicrous device from the entire season: the Fuschsbau coins that mess with people’s minds. Tying those coins to the murder of Nick’s parents make them even more important to the plot, which only helps to underline how out of place the coins are as a prop. In theory, the coins could function as a much darker take on one my most underrated Buffy episodes, “Older and Far Away,” with an episodic plot device slowly but surely altering the moods of every character and smashing them together like a particle accelerator. Instead, we get a one-note villain in Kimura, the last remaining member of a team seeking the Fuschbau coins who probably murdered Nick’s parents, but there’s bound to be another twist in that too-obvious story saved for next season. At first Kimura’s deathly obsession over the coins comes across stronger than the rather silly fixation Renard developed after handling the coins for the first time. But over the course of the episode, when Kimura says little else besides demanding the location of the coins, it wears thin, all the buildup for naught. I’m of two minds about Nick trying to tell Juliette everything about being a Grimm. On one hand, he gets so into finally letting out all the information that he works himself into a delirious groove, relentlessly piling on more unbelievable details, becoming more oblivious to Juliette’s befuddled reaction with every exasperated sentence. Conversely, Juliette’s reaction is a total buzzkill, as she jumps immediately to the crazy card, telling Nick he needs professional help. Nick’s trump, taking Juliette to see Monroe go full Blutbad, backfires when she passes out. I guess I can see why taking her to a hospital makes sense, but wouldn’t Rosalee be the better option, even if Juliette is so overwhelmed by all the Wesen details? 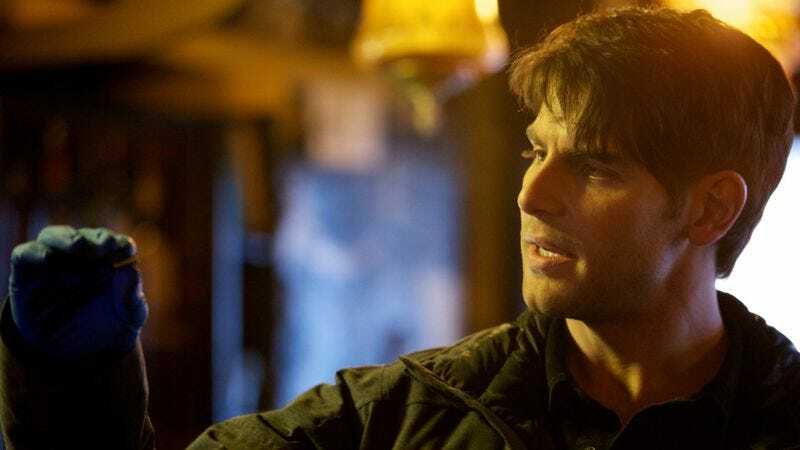 One of the biggest problems with Grimm at the outset was that the pilot presented several different directions the show could take, but never committing to a possibility for development. That noncommittal attitude carried over into the serialized plots this entire season, as the show moved in fits and starts to uncover patches of the greater international Wesen world, the underbelly of Portland, and advance Nick and Juliette’s relationship while keeping her and Hank in the dark about Nick’s newfound abilities. Now, it’s apparent that the show doesn’t have a clear idea of which story it wants to tell, so it’s telling all of them at once, to the detriment of every storyline—with the notable exception of Nick and Monroe’s friendship. That is still the one bright spot that has only strengthened with the addition of Rosalee, who thankfully shows up for a brief guest appearance tonight. Instead of picking one serialized element and providing some kind of conclusion or any answer, this finale introduces even more new questions. Sure, Nick’s mom being alive can be construed as kind of an answer to Nick’s sudden interest in his parents’ murder case that started a few weeks ago with Juliette as instigator and lead investigator. But really it just opens a door to tons of new queries, none of which the show seems interested in committing to, since we still have no idea what Renard is, what kind of hierarchy is in place, who the Reapers are, or any of the other overarching mythology. Grimm is now densely layered, with the Portland cases, Nick’s past and his parents murder, and international Wesen issues building outwards, but in shooting for a big, ambitious design, the small things are getting lost in the shuffle. To make a very rough comparison, this is like a haphazard imitation of LOST, answering questions with even more questions in order to delay giving any kind of answers for so long that it puts so much pressure on the eventual reveal that anything short of perfection will feel like failure. This isn’t a case of getting the stick instead of the carrot; it’s like finding out the whole thing was a mirage. Delaying answers to fundamental problems that have lingered since the pilot is a sign that there are no thought-out answers to these mysteries, since they’re going to play out over multiple seasons. My favorite episodes of this season—particularly “Organ Grinder,” still the high water mark for the series—found a way to blend a twist on a classic fairy tale, police procedural, and world building into one episode. At the time I said: “This could all just be a fluke, one great episode in the middle of a season that shows the potential Grimm never achieved in full,” and right now I sadly have to agree with that assessment. I started the season by comparing Grimm to the other fairy tale drama that premiered this season, ABC’s Once Upon A Time, which averages about double Grimm’s audience on Sunday nights. After almost an entire season heading in different directions with comparable premises, this finale shook Grimm in the direction of OUAT, insofar that it now seems more concerned with continued mystery than on resolution in episodic chunks. Of course, this is a season finale, so most likely the second season premiere will hastily bring all these disparate plots back to a simmer, and then put them on a backburner in favor of procedurals based on fairy tales that can be solved in an hour. 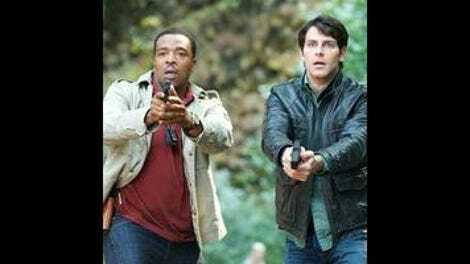 NBC is pushing Grimm into early production on season two, hoping to get an early jump after the London Olympics. That means about a three-month layoff for the show, as opposed to waiting until just before Halloween, when the pilot aired last fall. That’s not a lot of time for a change in approach, and adding Rosalee as a regular, in addition to Nick’s mother showing up, might only serve to make the show more convoluted. In spite of all this confusion and bustle, I still inexplicably find myself wanting to like Grimm. I enjoy the folk tales, the visual style, and Silas Weir Mitchell’s performance a great deal. But whenever the show gives me reason to hope for the best, it comes right back to shut down that optimism with the cold reality that it still doesn’t know what it wants to be. This week’s epigraph comes from “Little Briar Rose,” better known as “Sleeping Beauty.” It’s an entirely oblique reference to Juliette passing out I guess, but it doesn’t make much sense considering she wakes up all possessed at the end. Crazy theory: the cat scratch turned Julilette into a Wesen. This development would make Juliette 1000% more interesting as a character, as would Hank devolving into some kind of insane conspiracy theorist out to prove to the world that Wesen exist. But I have to put the brakes on speculation and only analyze what we’ve got on screen, he said, trying to calm down. Terrible throwaway line: Nick yelling “I’ll give you this!” at Kimura during their fight in the kitchen. That brings us to the end of Grimm coverage for at least a few months. Thanks to everyone who stuck around in the comments this season through the ups and downs. I’m going to re-watch Angel in the few months before the second season stars up again in late summer, hope you’ll all still like to follow along.